Leftover ham after a holiday? 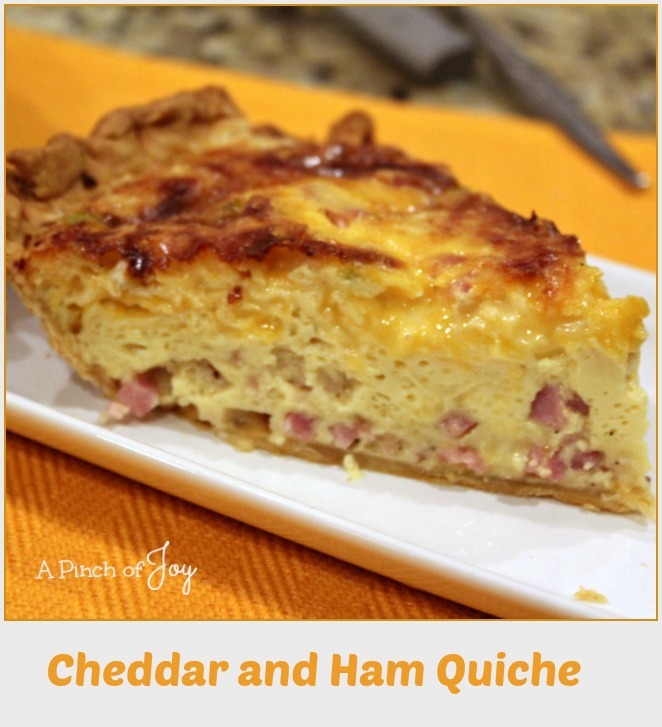 Cheddar and Ham Quiche will help you solve the problem of what to do. Quick, easy and tasty, too. Cooking with evaporated milk is something relatively new to me. I stopped drinking milk with meals about 3 years ago. Love cold milk, but it wasn’t returning the love! No more gallon jugs of milk in the fridge. I was going through a couple of gallons a week and now half a gallon will last almost three weeks. I still cook with milk, but there isn’t always enough in the fridge for the recipe I want to make. Or if there is, its past the due date and a little sniffy – can I admit that?? So I started keeping a can or two of evaporated milk on the pantry shelf. It also comes in handy for times when it is blizzarding outside and a trip to the store is the last thing on anybody’s list. Like tonight. It’s spring! A blizzard – really? We already had one of those this year. It was a truly overboard event, but it was decent enough to come in the winter at least! It’s tempting to dive right in when this delicious aroma surrounds the quiche when you pull it out of the oven. But resist and let it set about 10 minutes. It will finish baking and be just cool enough that you can really enjoy the savory flavors. Delicious and nutritious. Perfect for breakfast, lunch or dinner! Deliciously savory and nutritious too! Press unbaked pie crust into deep pie pan and crimp edges. Set pie pan on cookie sheet or pizza pan to aid in moving the quiche without spilling. 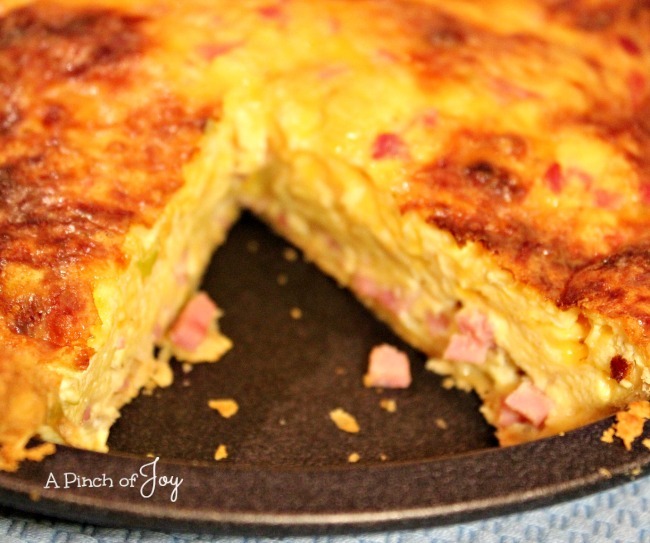 Sprinkle ½ cup shredded cheddar, ham and green onions evenly over the pie crust. Whisk together milk and eggs until well mixed. Whisk flour, salt and pepper into mixture. Bake for 45-50 minutes or until table knife inserted near the center of the filling comes out clean. Cool for about 10 minutes on wire rack before serving.